Head coach Gary Kubiak of the Denver Broncos in the third quarter of the game against the Oakland Raiders at Sports Authority Field at Mile High on January 1, 2017 in Denver, Colorado. Gary Kubiak and Broncos break up! Sources say differences in offensive philosophies and assistant coaches lead to new head coach Vic Fangio looking for his own offensive coordinator. Mike Munchak may be new offensive line coach. KUSA – Once again, Gary Kubiak is gone and this time there will be no press conference. One of the best coaches in Broncos history, the team and Kubiak mutually decided to part ways from what would have been an offensive coordinator role after there was a breakdown in philosophy and staffing between the two parties, team sources told 9News. Broncos new head coach Vic Fangio will interview San Francisco 49ers quarterbacks coach Rich Scangarello for their vacant offensive coordinator job (technically, Bill Musgrave is still holds the position but he will not return). Scangarello has several connections with the Broncos. First, he has worked a total of three seasons under Kyle Shanahan, whom Broncos' general manager John Elway nearly hired as head coach in 2017, before opting for Vance Joseph instead. Scangarello and Fangio also share the same agent. The 49ers have so far blocked the Broncos from interviewing Scangarello so it appears Fangio has some administrative hurdles to clear to get his man. The Broncos are also hoping to hire Mike Munchak as their offensive line coach – a lateral move from the job he has now with the Pittsburgh Steelers but one Munchak apparently would be willing to make because he has a daughter and grandchild living in the Denver area. There is also a chance the Broncos may pump up Munchak's title. Munchak was a finalist for the Broncos’ head coaching position but finished second to Vic Fangio. Munchak and Fangio grew up within three to five miles of each other in Northeastern Pennsylvania. Talks between Broncos general manager John Elway and Kubiak on Kubiak’s offensive coaching role have gone back-and-forth for weeks. Elway was always skeptical whether Kubiak would remain healthy enough to handle the offensive coordinator role. Kubiak had two debilitating headache attacks that resulted in hospital stays during his last two stints as head coach – in 2013 with the Houston Texans and 2016 with the Broncos. The episode on the sidelines with the Texans was diagnosed as a transient ischemic attack, or TIA mini stroke. Kubiak had similar symptoms when he was struck following the Broncos’ fifth game of the 2016 season, although the team referred to it as a “complex migraine” issue. After missing one game, Kubiak finished out the 2016 season, then announced his retirement from coaching because of health reasons. He served the past two seasons as a Broncos’ front office consultant to Elway, but then wanted to return as an offensive coordinator. Elway cautiously went forward with tentative plans of bringing Kubiak in as an offensive coordinator, but ultimately wanted his new head coach to pick his own staff. The team then sent out word during the head coach interview process that Kubiak would take on a broader role overseeing the offense, but would not work hour-to-hour, day-to-day on game planning and calling the plays from the sidelines on game days. In the meantime, Elway hoped to hire a younger, more offensively modern coach to become his offensive coordinator. But as Fangio was hired as head coach, Kubiak convinced all parties he was physically ready to handle the offensive coordinator responsibilities. Fangio, Kubiak and Elway were moving forward with finalizing his role when some glitches occurred. According to team sources, there were philosophically differences in concepts and schemes, although they stopped short of specifics. There were also differences in staffing. 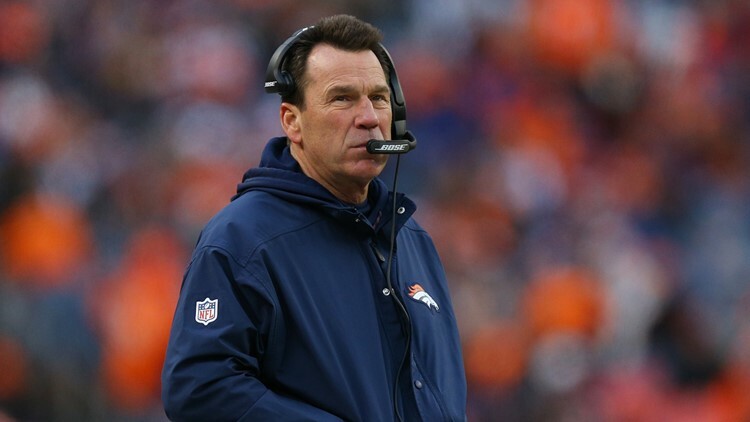 9News had reported Kubiak wanted to bring back two of his longtime assistants, Rick Dennison and Brian Pariani. Dennison had been a longtime offensive line coach and run-game coordinator for Kubiak. Pariani was a longtime tight ends coach for Kubiak. When Kubiak retired after the 2016 season, the Broncos dismissed both Dennison and Pariani and there seemed to be a problem in bringing them back. It also appeared Klint Kubiak, Gary’s son, was in position to get promoted from assistant quarterbacks’ coach to lead quarterbacks coach. The separation was unfortunate in the sense Gary Kubiak had been one of the best Bronco bosses in franchise history, both in a subservient role and as the top leader. He was the Broncos’ backup quarterback to Elway from 1983-91. He also served as offensive coordinator to head coach Mike Shanahan from 1995-2005, helping the Broncos win back-to-back Super Bowls in the 1997-98 seasons. After leaving to take the Texans’ head coaching job in 2006, Kubiak returned to become the Broncos’ head coach in 2015. In his first season as Broncos head coach, Kubiak guided two quarterbacks – an aging Peyton Manning, and first-time starter Brock Osweiler – plus a sensational defense to the Super Bowl 50 title. But after a 4-0 start in 2016, the Broncos lost 7 of their final 12 games and missed the playoffs. During his two-year stretch as head coach, the Broncos finished 24th in scoring at 19.4 points per game. But Kubiak did draw interest from multiple teams as an offensive coordinator this offseason, before telling people he was staying with the Broncos. So where do the Broncos go now with their offensive coordinator? Elway may have had interest in Rams quarterbacks coach Zac Taylor after he interviewed him for his head coach position last week. But Taylor is in line to become head coach of the Cincinnati Bengals. Fangio will now work with Elway to try and find another offensive coordinator – which is not unusual for any head coach one day after he gets on the job. What is unusual is the rather sudden breakup with such a Broncos’ coaching legend as Gary Kubiak. One lesson that came out of this: The Broncos are Fangio’s team. Welcome to Broncos Country, Vic Fangio, where unexpected drama has not been all that uncommon.